Poll Management System Android App Guidelines for implementing Poll Management System in Elections 2019. General Election Poll Management System Android App Download. Guidelines for implementing Poll Management System. Android mobile APP is developed for reporting various events by Presiding Officer during the process of Conduct of Election:s Presiding Officer plays a key role in furnishing timely information to enable CEO AP/ DEO/Returning Officers for onward reporting to various levels.
. Website Dashboards are provided to monitor the timely reports entered by the Presiding Officer in the mobile app. They must be instructed to carry smart phone to the polling duties. Mobile Android App is placed at http://36.255.252.196/emsqdash/assets/app/ems.apk for the purpose of training for 3 days time. Logins and passwords for created constituency wise from AC 1 to AC 175. These logins and passwords are psno_1 to psno 175 for each constituency Each event should be reported as YES once it is done in a periodical time. 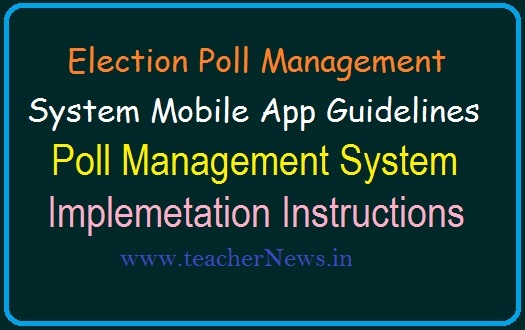 Election Poll Management System Mobile App Guidelines | Implementing Poll Management System in Elections 2019.